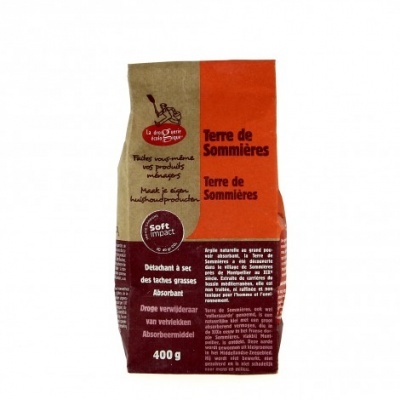 A natural stain remover (Terre de Sommieres) consists of powdered clay. An incredible dry stain remover that does not leave any trace and which removes greasy stains from delicate textiles or furnishing fabrics. It is also particularly effective for carpets, leather, marble, granite, wood furniture and hard floors. A natural stain remover (Terre de Sommieres) consists of powdered clay which is often ochre-coloured (even if there are different shades: from white to purple, from light brown to green). It is an ultra-fine smectic clay which can absorb up to 80% of its own weight in water. This clay is an incredible dry stain remover that does not leave any trace and which removes greasy stains (oil, butter, fuel, make-up, etc.) even from delicate textiles (i.e. : silk), from furnishing fabrics. It is also particularly effective for carpets, leather, marble, granite, wood furniture, floors (tiles, stone, woods, concrete). It absorbs and removes many other kinds of stains too: pet urine from pillows, wine from a tablecloth, etc.